A 1964 Aston Martin DB5 became the first ever classic car sale completed via social media when it was sold for £825,000 by international auctioneers Coys on the next-generation platform Vero. The sale also marked the largest known transaction made via Apple Pay. The car is one of the highly sought-after right hand drive silver birch models with red leather trim. It has undergone a full restoration – including engine rebuild, suspension and gearbox overhaul following 20 years in dry storage, during which time it was not used. Coys had announced earlier in the month at the Mondial de L’Automobile - Paris Motor Show, which remains the most visited automobile show in the world with 1,066,439 visitors, that customers would be able to purchase a selection of historic cars via Vero, including the iconic DB5 which featured in their exhibition area at the international biennial event. 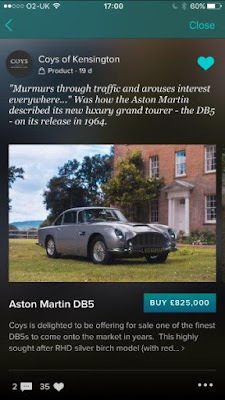 The buyer, who wished to remain anonymous, bought the DB5 with Apple Pay directly from the Coys profile on Vero after seeing it at the show. Other historic cars currently listed and available for instant purchase on Coys’ Vero profile include a £400,000 Ferrari Dino 246 once owned by Peter Grant (manager of the legendary band Led Zeppelin), an £800,000 Ferrari Daytona and a £295,000 Bentley Continental S2.